Test your strength and strategic thinking with Tug-of-War on the farm! This attraction, new for 2017, is a great family and team building activity that’s a lot of fun for kids and adults alike. 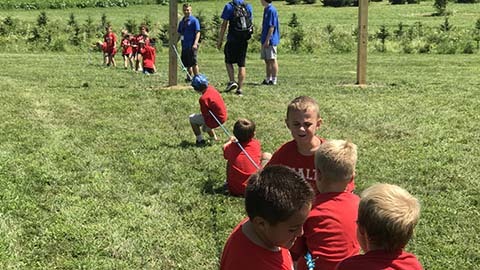 Tug-of-war is a traditional field day activity that fits in perfectly here at the farm. Teams tug and pull with all their might, hoping to pull the marker across the line and declare victory against their opponents. Pull against your family members and friends, or pull together against another group! Children and adults of all ages are welcome to join in the fun. Our new Tug-of-War activity features three rope stations so there’s plenty of room for everyone to participate. Looking for other farm activities that test your athleticism? Check out our All Ages Sports Center and our Jump Park!